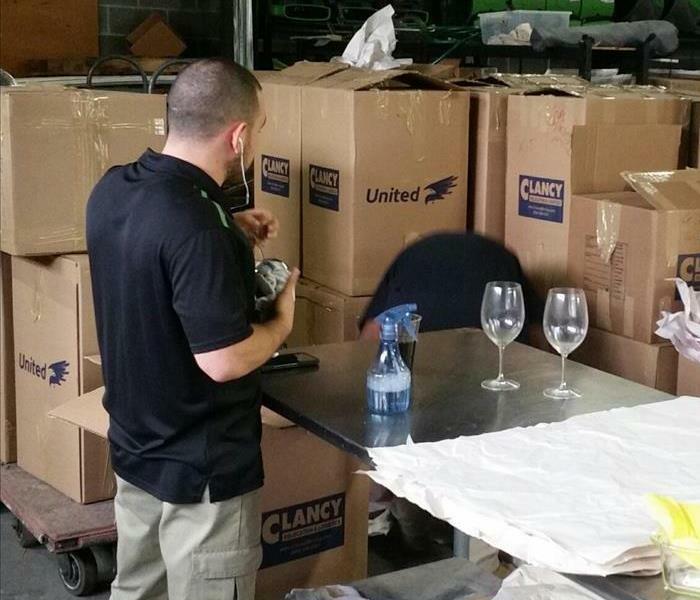 After a tornado came through Chappaqua, NY, we were called for an emergency water cleanup. Water had intruded in to this residence. This cleanup required that we remove a lot of wet material and set a generous amount of dry equipment. Due to a neighboring unit having a fire, our crews went to work to do a general cleaning on this Bronxville apartment. There was no real residue or smell but these residents were thrilled with the cleaning that we did for them! We spent that day at Yonkers schools this past year to get involved in the school career fair. Here at SERVPRO of Scarsdale/Mount Vernon it is very important to us to be involved in the education of why hard work is important to our local kids. 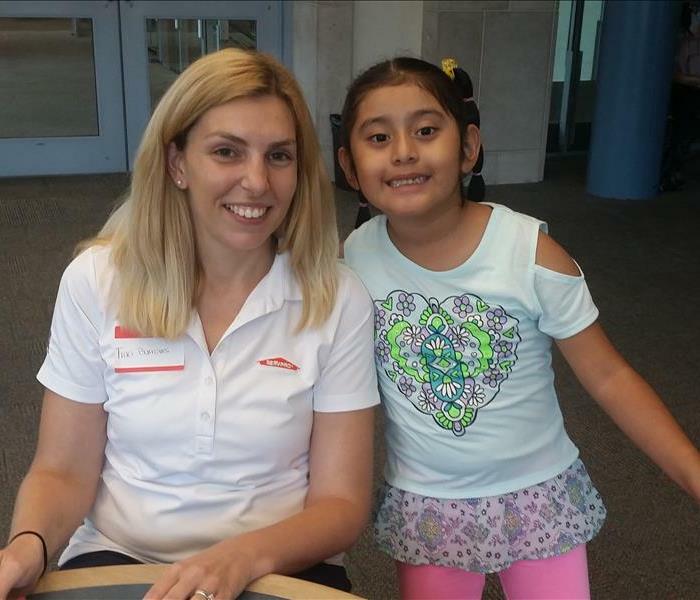 Here you see our Sales Marketing Manager, Traci Burrows attending and participating in summer reading buddies at Yonkers library for United Way of Westchester. She had a great day hanging out with local community children and felt honored to be able to read to them! Here you see our Sales Marketing Manager, Traci Burrows, working out in our community with the American Red Cross for "Sound the Alarm." She spend the day installing FREE smoke detectors in many neighborhood homes. It is people like her that make our communities a safer place to live! After a tree fell on a Scarsdale home after a very bad storm, these homeowners contacted us to come and get the water out of their home. Within hours we stabilized the situation and began the water damage cleanup process. SERVPRO has professional cleaning equipment to restore your household items back to normal conditions. 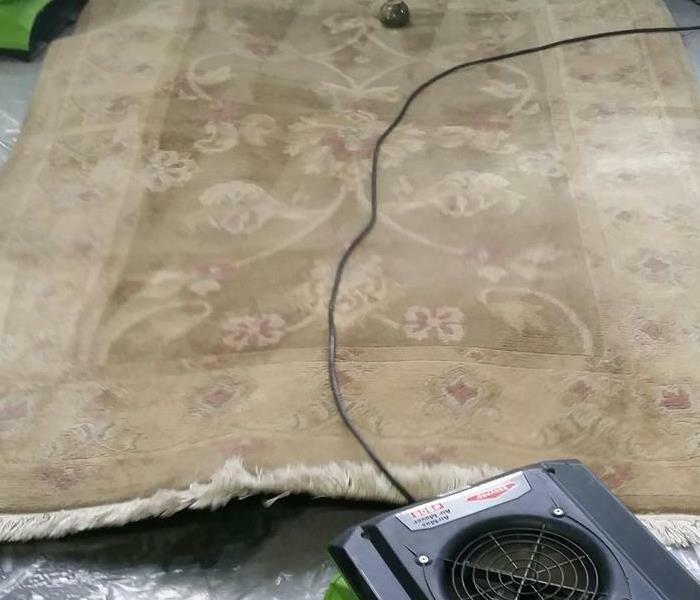 This rug was professionally cleaned, removing stains and restored back to pre water conditions. The air movers were used to dry quickly. We have professional drying equipment ready for your storm, water, fire, or mold remediation restoration emergency. The team is professionally trained and ready to respond 24 hours a day 7 days a week. After a kitchen fire the entire kitchen had to be gutted down to the studs. The smoke damage had significant loss. The owners were impressed by how they responded and how quickly their kitchen was restored back to normal. After a kitchen fire, SERVPRO responded immediately to the scene. There was significant smoke and soot damage. 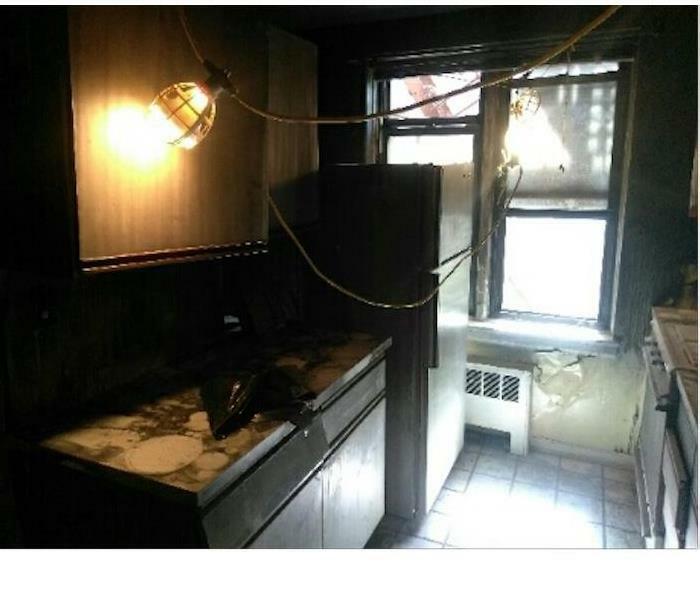 The team quickly began clean up and was able to restore the kitchen back to pre fire conditions. 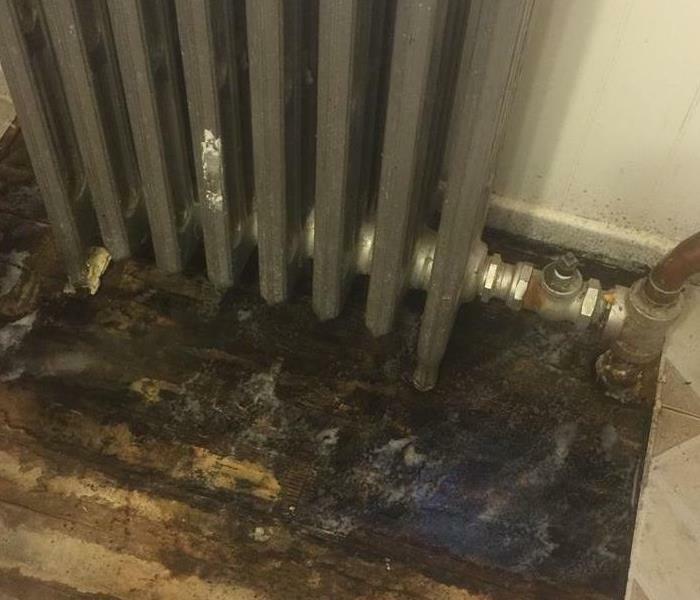 This was the aftermath of a water loss in a Scarsdale home. 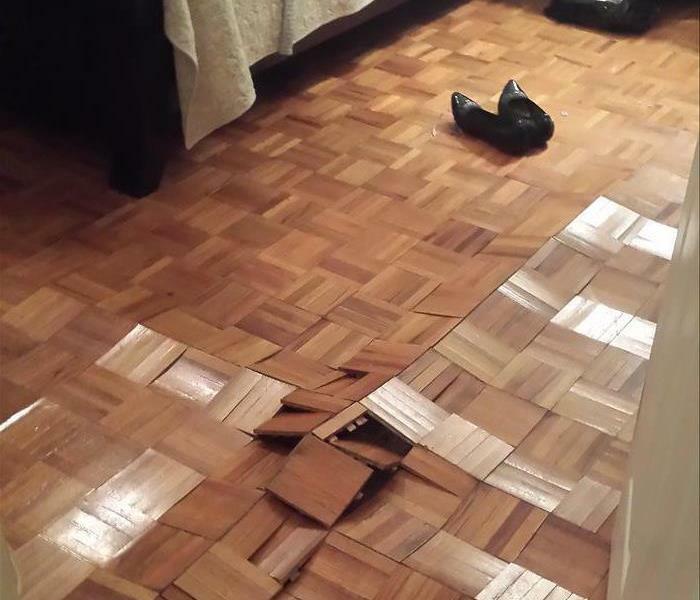 The flooring and belongings suffered from significant water damage. 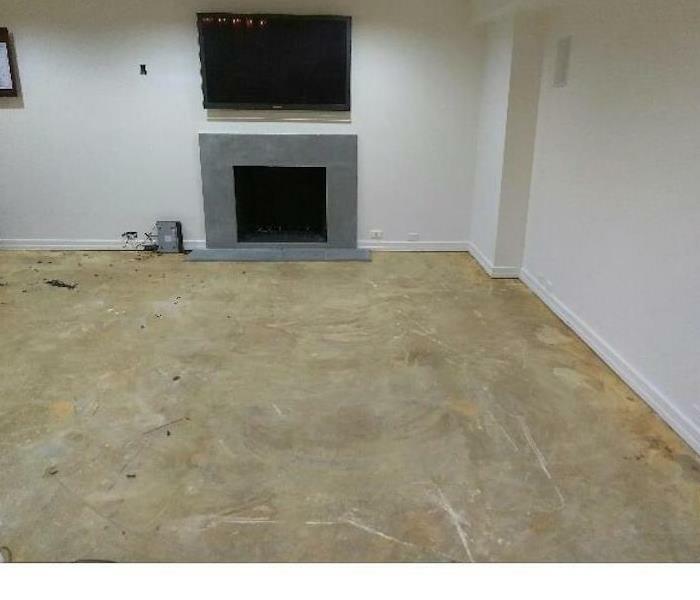 SERVPRO was able to remove and dry the flooring along with belongings to return the home back to normal conditions. 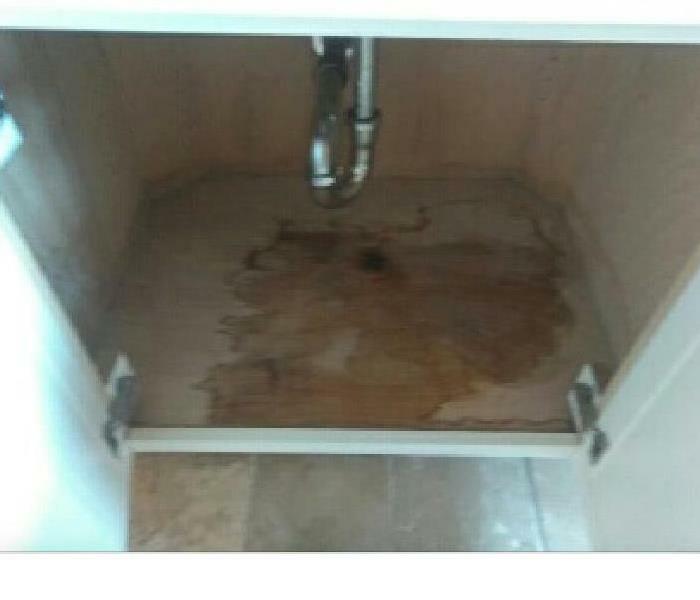 This bathroom suffered from a water leak under the vanity. 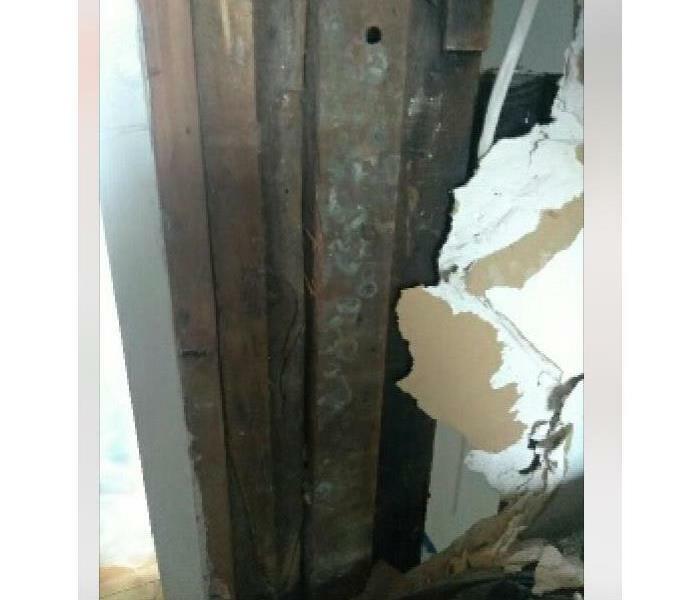 The leak had appeared to be leaking for sometime causing the vanity to rot. SERVPRO responded and was able to dry the area and remove mold and mildew. 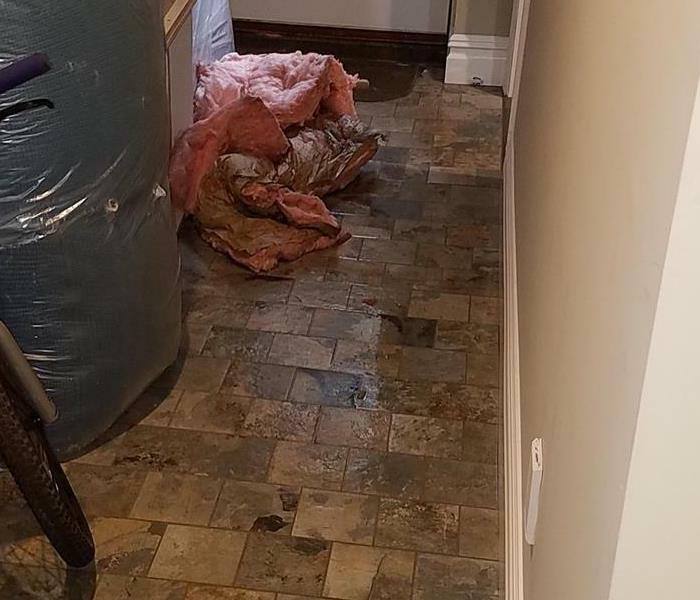 This home suffered from water damage due to a broiler leak. SERVPRO responded to quickly begin clean up on this home. They brought in air movers to dry the floors and performed flood cuts to dry behind the drywall. This home suffered mold damage after a pipe break. The water from the break damaged drywall and dried causing mold to grow behind the wall. SERVPRO responded and tore out drywall and treated and cleaned mold. This home had a fire that left the interior covered in soot and smelling like smoke. 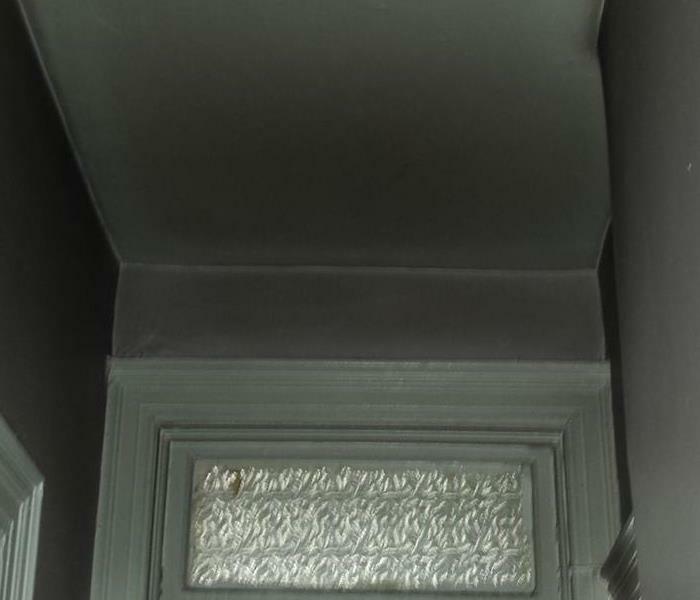 Here you can see one of our air scrubbers in place to help filter the smell of smoke out of the home. When your home has been damaged by fire, one of the things that needs to be done before repairs can be performed is to pack out your personal belongings. In this image, you can the process in progress. 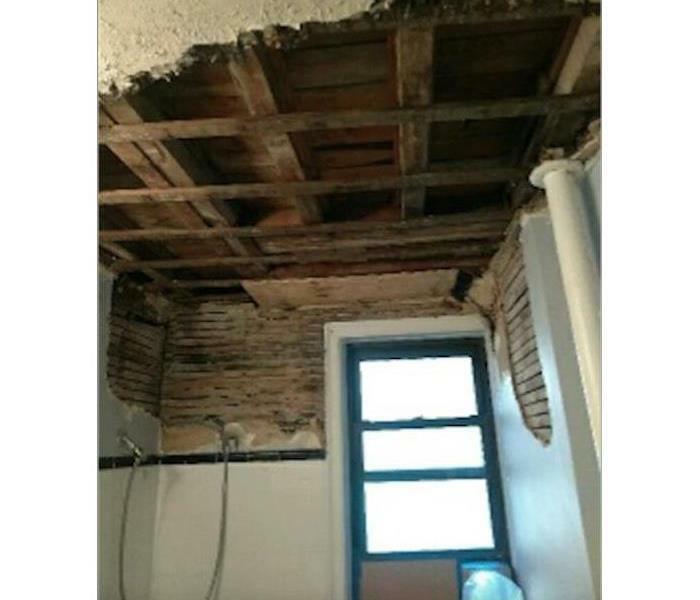 This home suffered from a water loss from leak in ceiling. 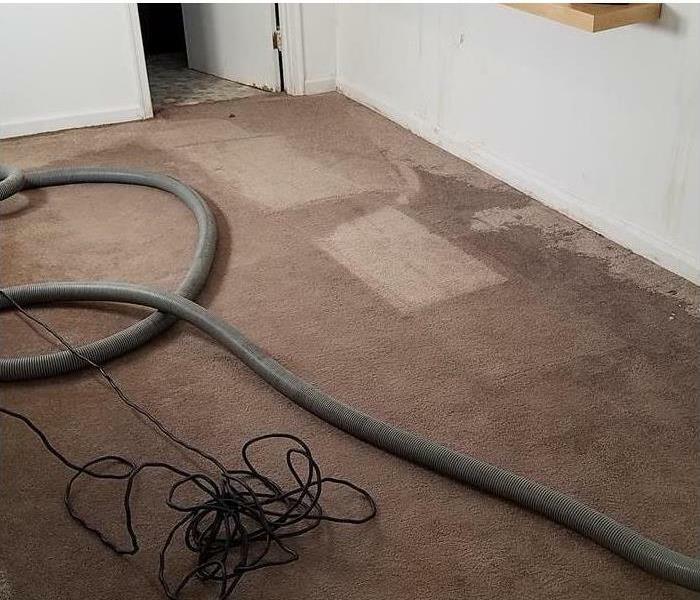 The carpet was soaked from water. 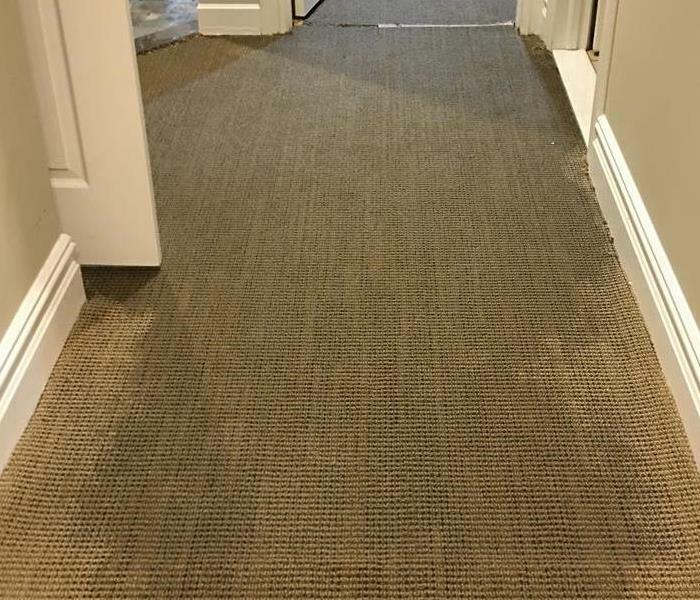 SERVPRO came in and quickly extracted the water from the carpet. The subfloor was wet so the carpet had to be replaced. This home suffered from water damage in the entry way. SERVPRO responded and quickly began mitigation to get the water up. They brought in air movers to dry the floors and return to pre loss conditions. SERVPRO was called to this property after a storm. After a snow storm the property had gotten water inside from the snow melting on the roof. They came in and extracted the water and dried the property. Storm damage can come anytime day or night. 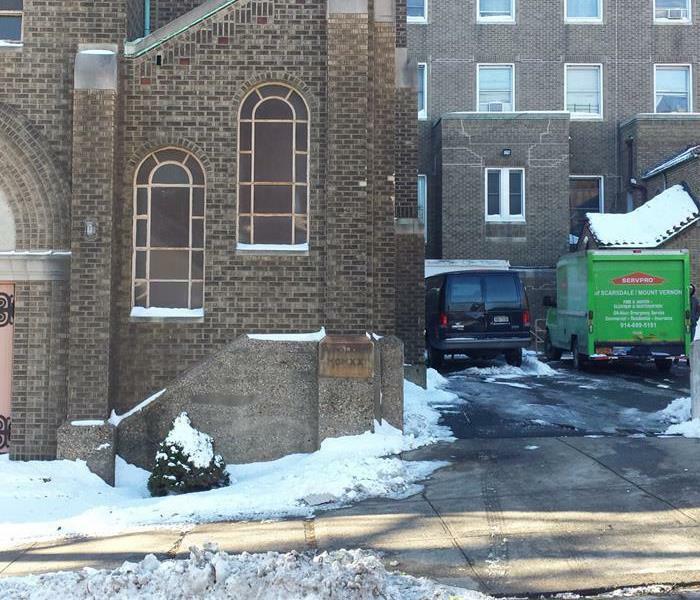 SERVPRO was called to this building after a water loss from a storm. 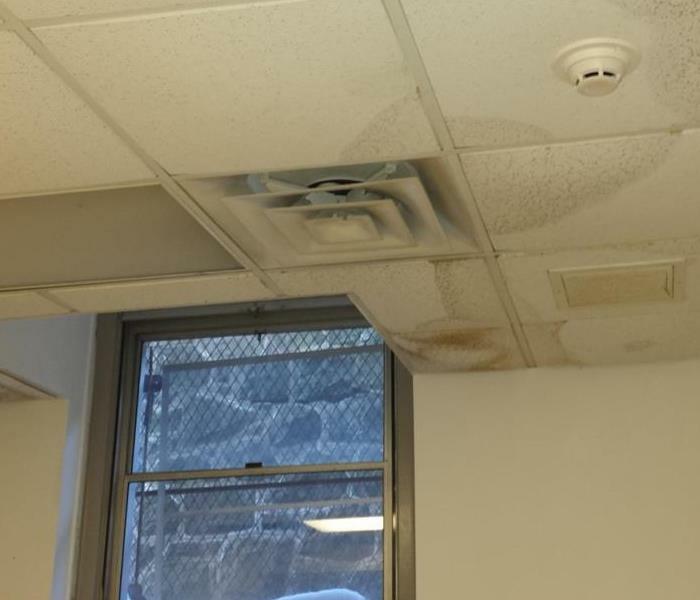 The ceiling tiles were stained and replaced after drying the room. After a fire, you can also find yourself with a lot of water in your home from fire fighting efforts. It can be a big mess. 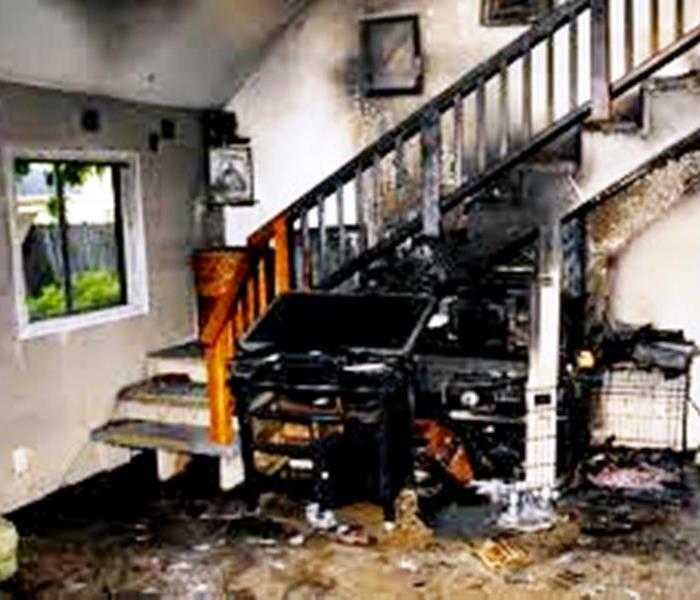 So, if your home has suffered from a fire and is now also wet, call us. We'll make it "Like it never even happened." 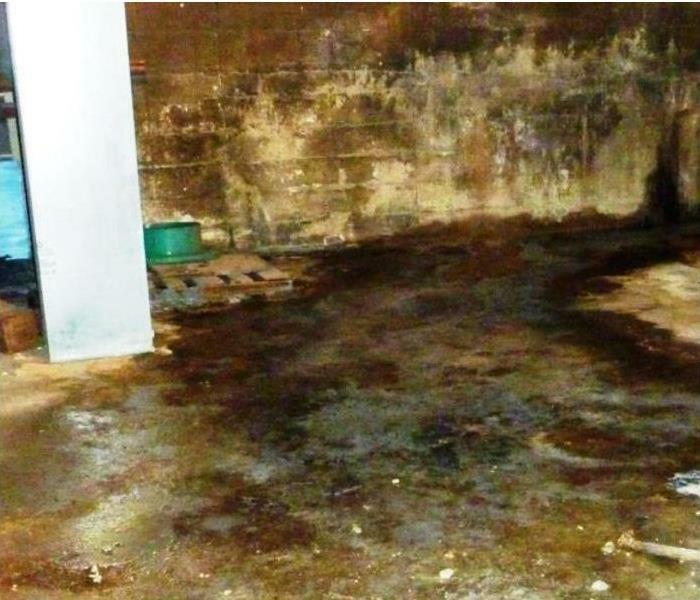 This basement was heavily flooded during a large storm that affected our area. 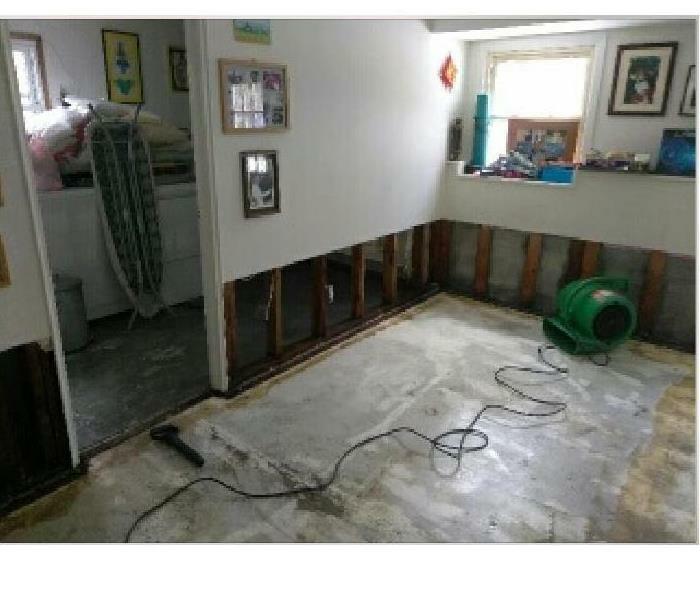 This sort of flooding can happen quickly, so if severe storms cause your basement to become flooded like this, give us a call. 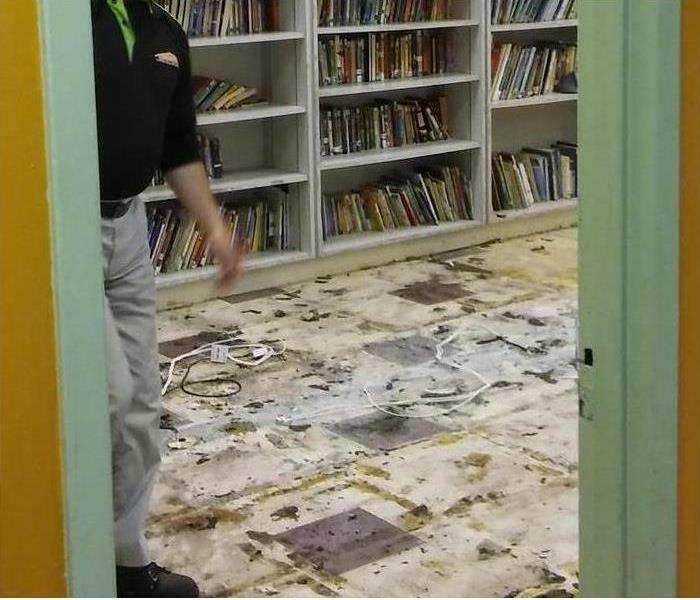 This library was flooded when severe storms dumped large amounts of rain on our area. The storm waters clogged a storm drain with debris that caused water to enter the facility. If you have storm damage, call us! 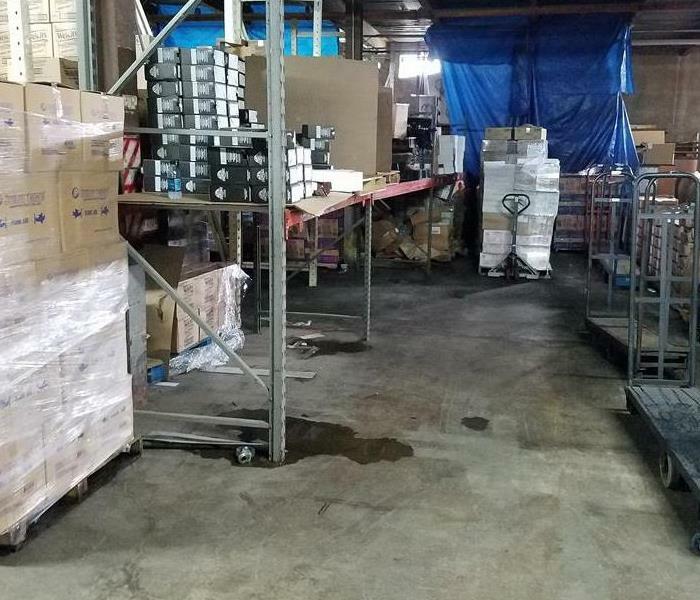 This room was damaged by a storm water intrusion that was the result of heavy rains from severe storms that rolled through our area. If you have damage from a storm water intrusion, give us a call! 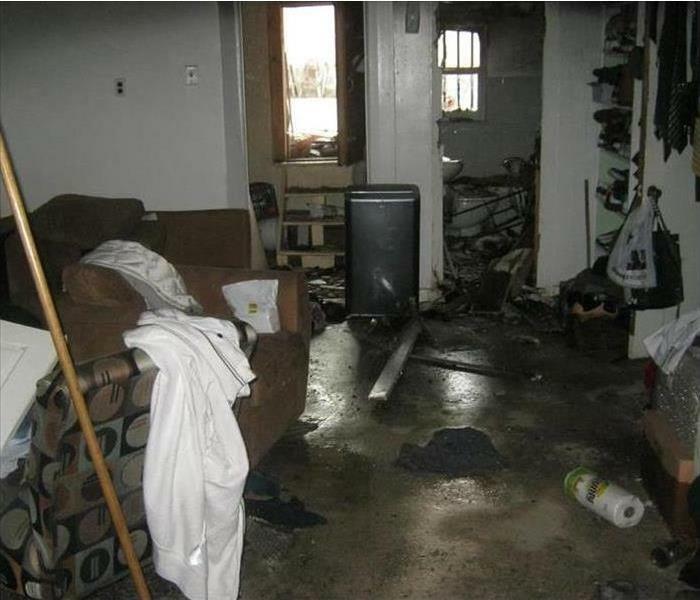 This home had furniture that was damaged after the home was flooded. SERVPRO was quick to respond to begin the mitigation process. 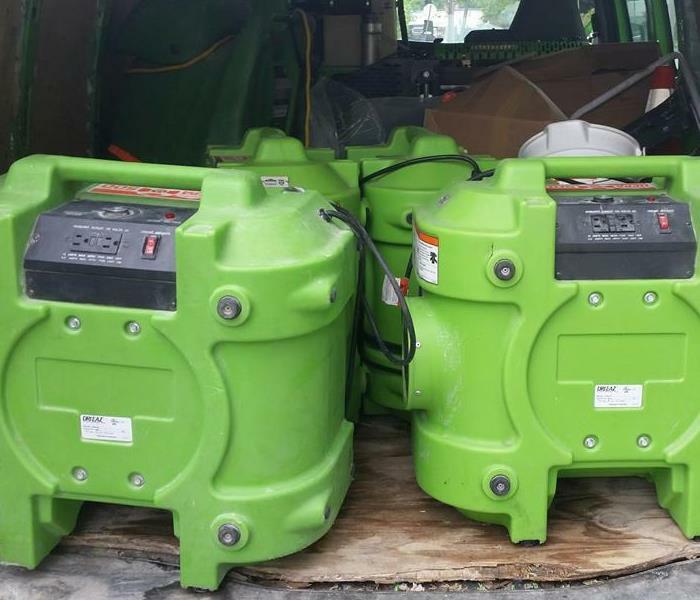 Once all of the water was removed, SERVPRO was able to place plenty of drying equipment throughout the home. 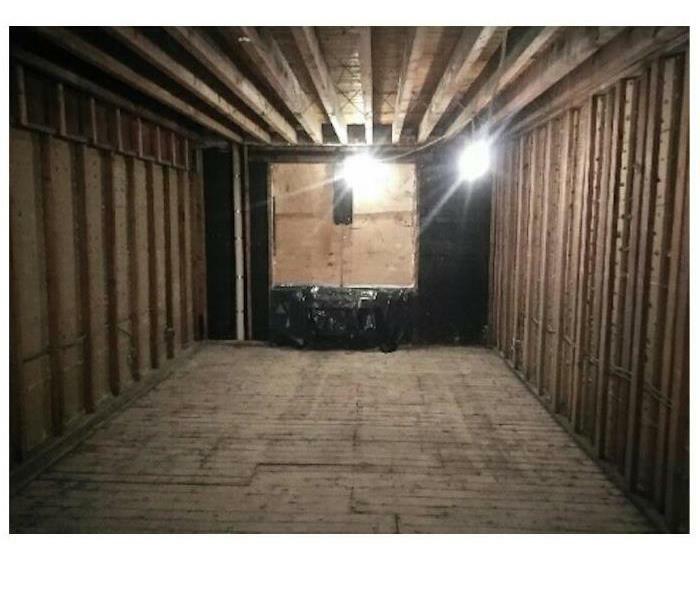 This home had massive amounts of water damage. SERVPRO was quick to respond and begin the mitigation process. Our team was able to place drying equipment to get this home dry and back to pre loss condition. 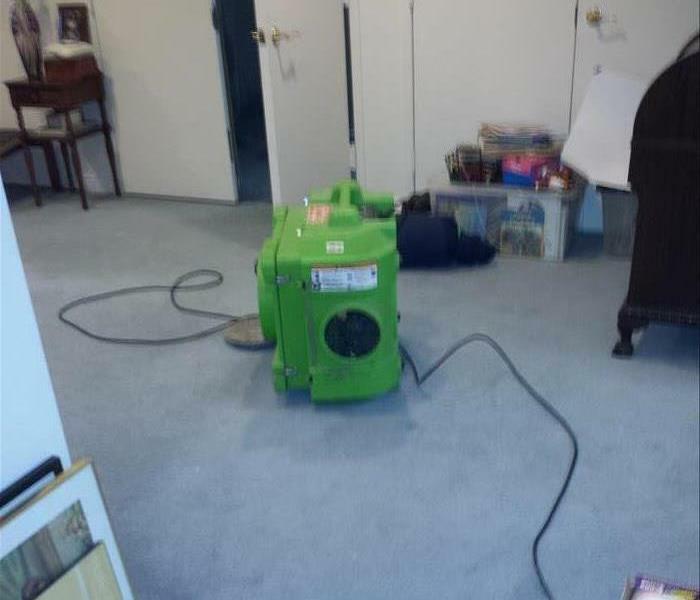 SERVPRO of Scarsdale / Mount Vernon was called to help clean up this water damage in a local home. Our team was quick to get on site and start extracting all of the water. Once the water was all pulled up, the team began placing drying equipment throughout the home. 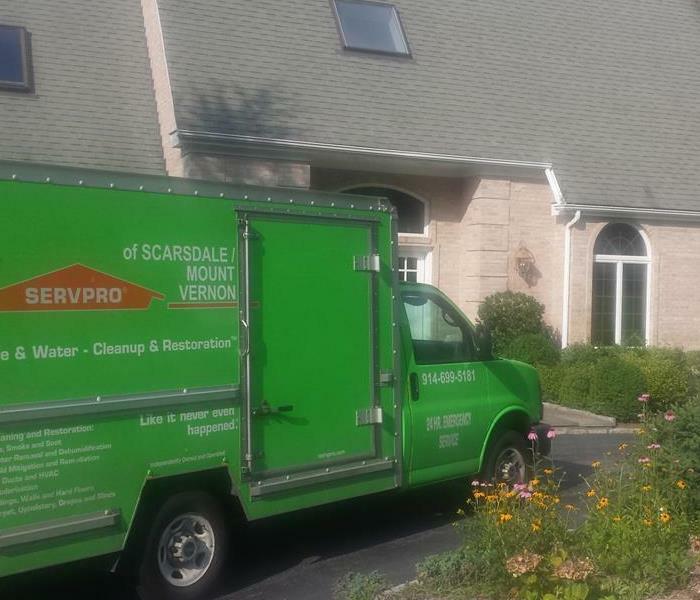 SERVPRO of Scarsdale / Mount Vernon ready to help! 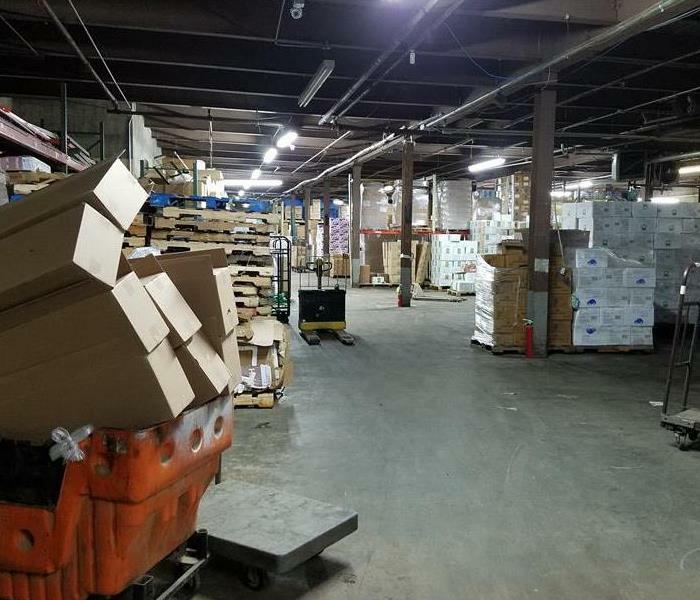 No matter what time of day it is, SERVPRO of Scarsdale / Mount Vernon is always ready to help your business. Our crews are on call 24 hours a day. Let us know if you have any questions. 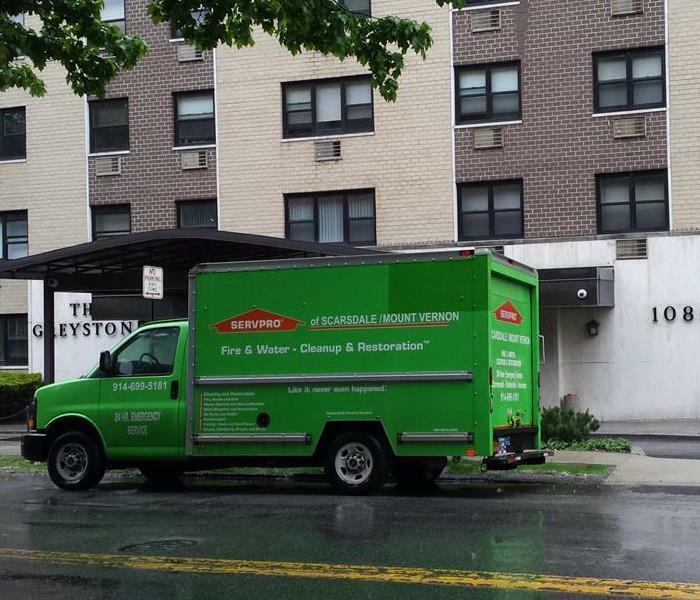 SERVPRO of Scarsdale / Mount Vernon can respond to your water loss in your home or business. They have restoration emergency teams that can respond immediately. They have technicians that specialize in odor control and can clean your upholstery and fabrics. SERVPRO has special processes for Mold Remediation. 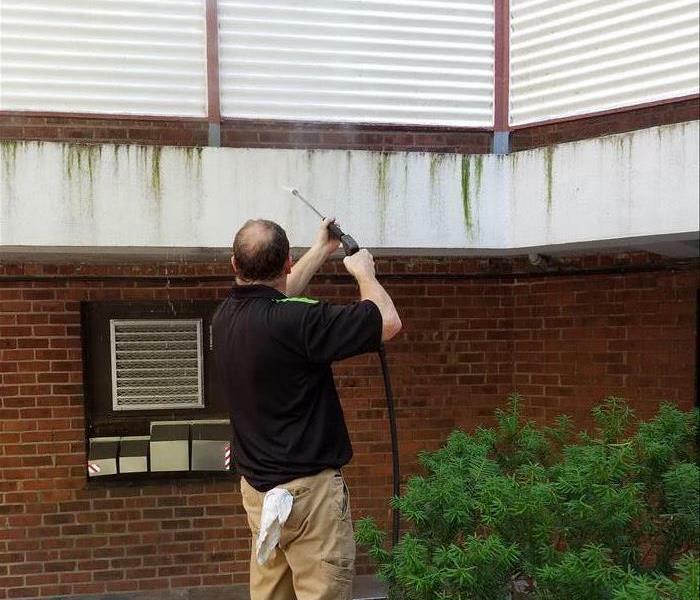 This is a picture of the process of cleaning mold off the side of a building. The technicians have special cleaning techniques and cleaning solutions to ensure the job is done correctly. This is the after picture of commercial property after water loss. SERVPRO can assist in any type of water damage in your home or business. They have the right equipment to extract the water from the floor and quickly dry area and prep areas for rebuild. 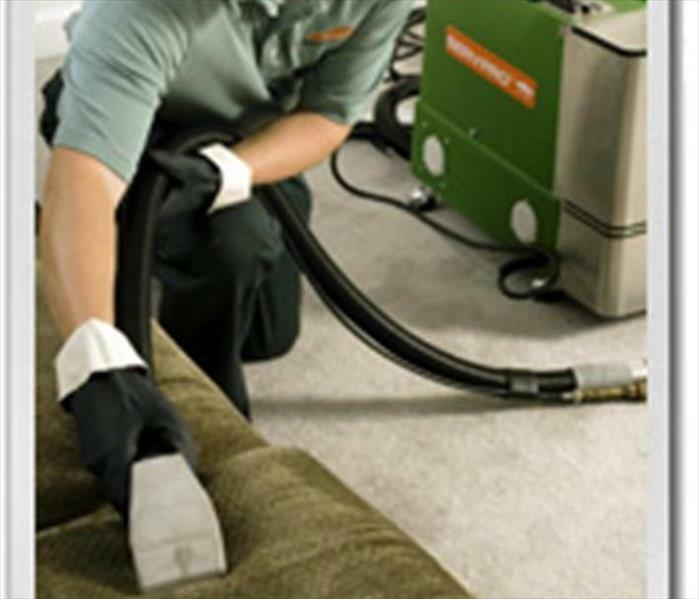 SERVPRO has the expertise and professional cleaning equipment to take care of any mold. 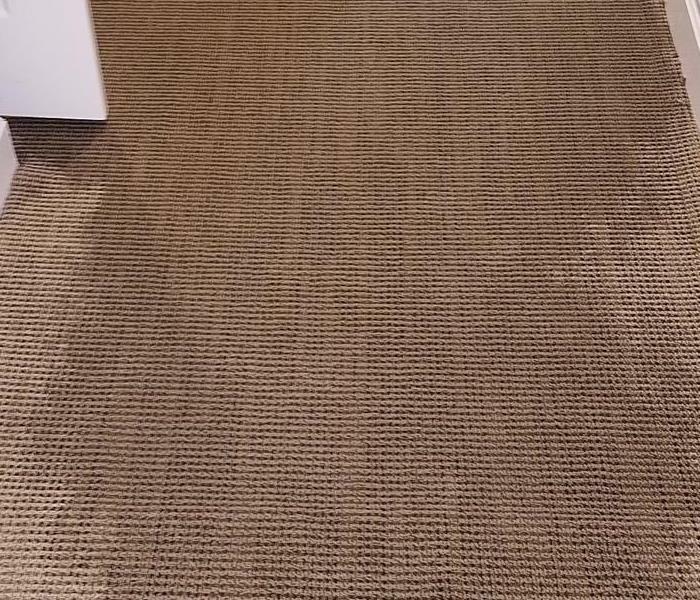 The technicians have cleaning techniques that can take away mold odors and help clean and ensure nothing can spread throughout your home or business. SERVPRO responded to this home and found significant mold damage. 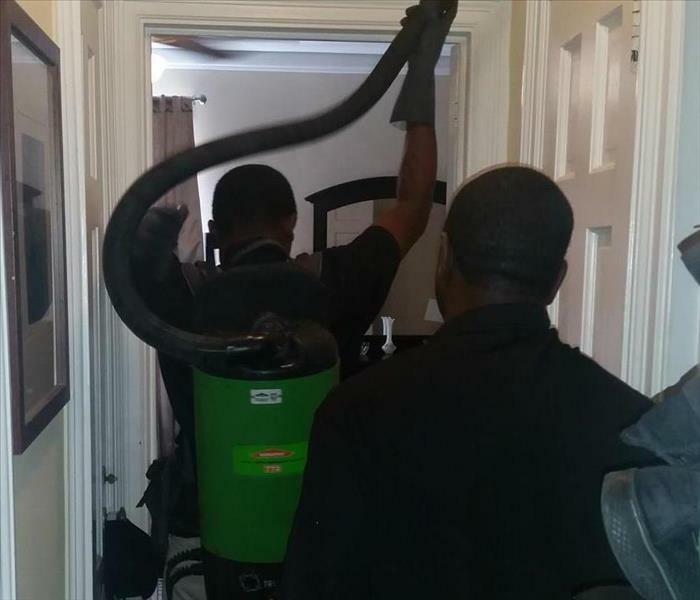 The team has the experience and professional cleaning equipment to assist in mold remediation in your home or business. They quickly began cleaning and tear out of affected area to ensure it was safe. 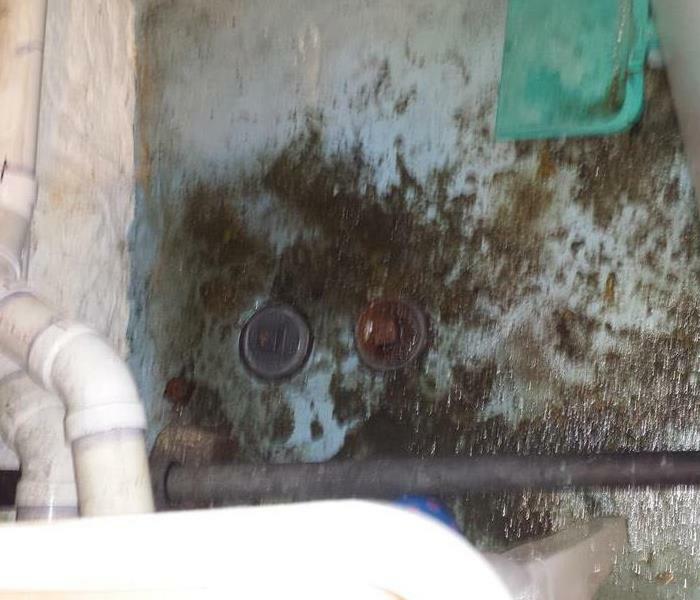 SERVPRO responded to this property with sewage water damage in multiple rooms. It takes special training and equipment to clean the area as it can be contaminated and can be very dangerous. They have the expertise to ensure your home is safe after clean up. 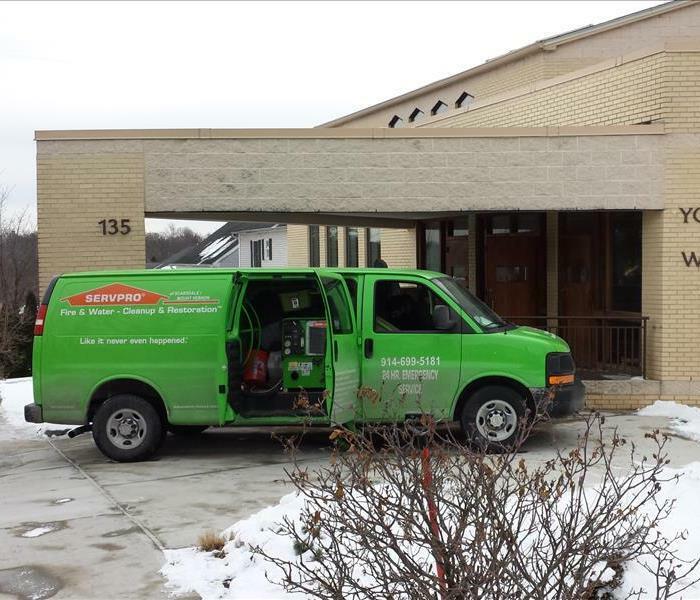 SERVPRO can respond to any of your commercial restoration emergencies such as fire, water, mold, or storm. They have the trained technicians for any of your needs. They can move content and restore your belongings to like new conditions. 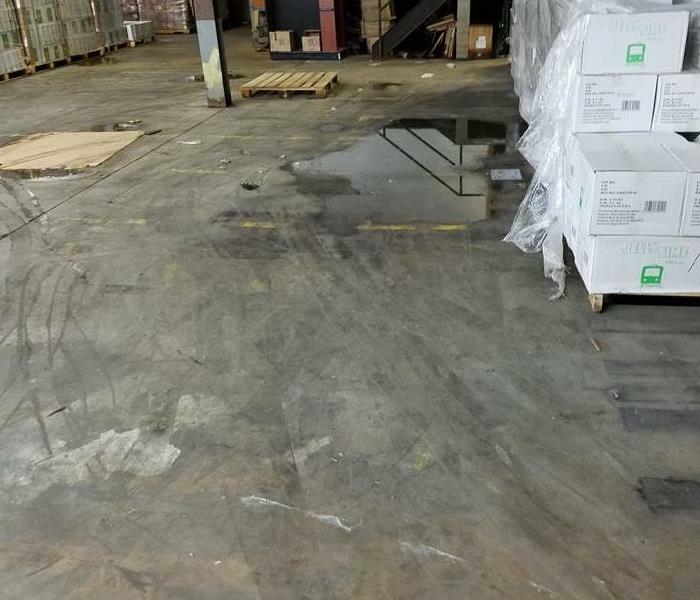 SERVPRO responded to this commercial property with water restoration emergency. The technicians can quickly remove all the content affected by the area and begin clean up. Tarps and plastic can be used to protect your content from getting damaged. 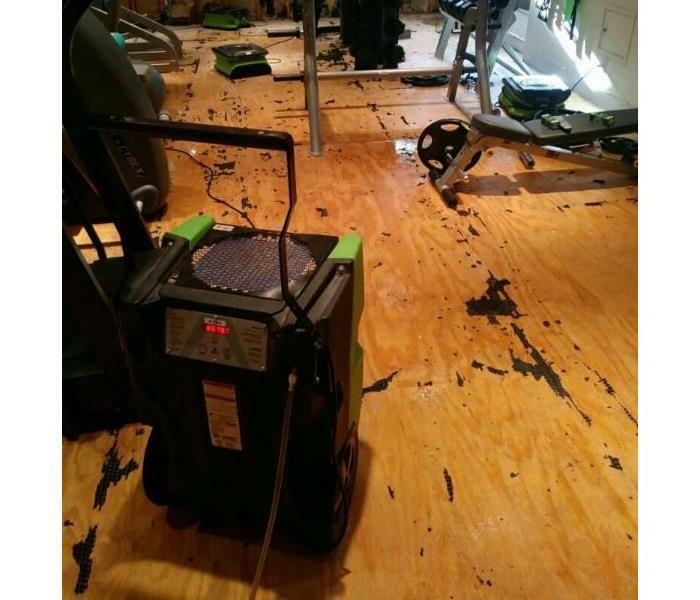 SERVPRO has the expertise and equipment for any water damage emergency. 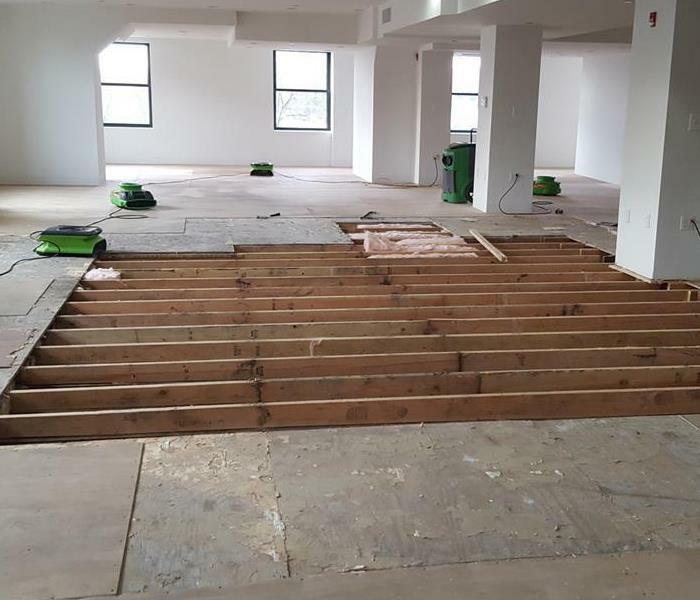 This is a picture of the floor lifting from water getting underneath floor and pushing it up off the subfloor. They have the equipment to extract the water off the floor followed by the drying process. 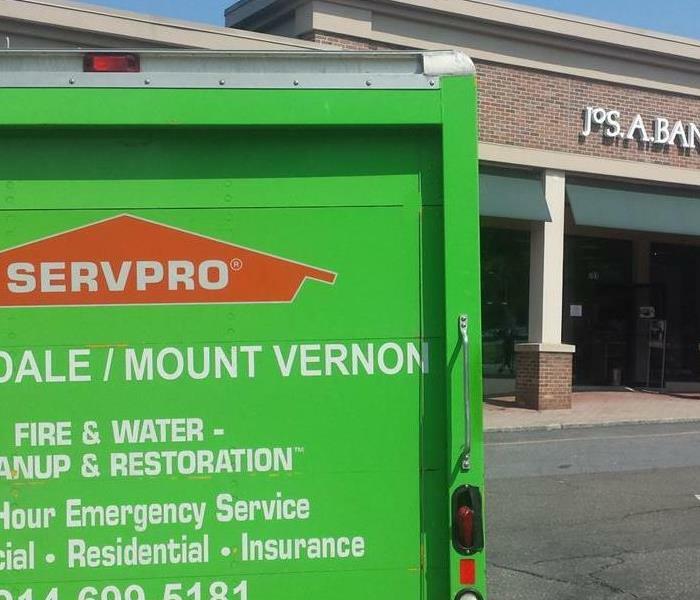 SERVPRO of Scarsdale / Mount Vernon has technicians ready to show up for any water or fire damage emergency. The smoke can cause severe damage and odor. We have the expertise to remove all damages and odor affected by fire. 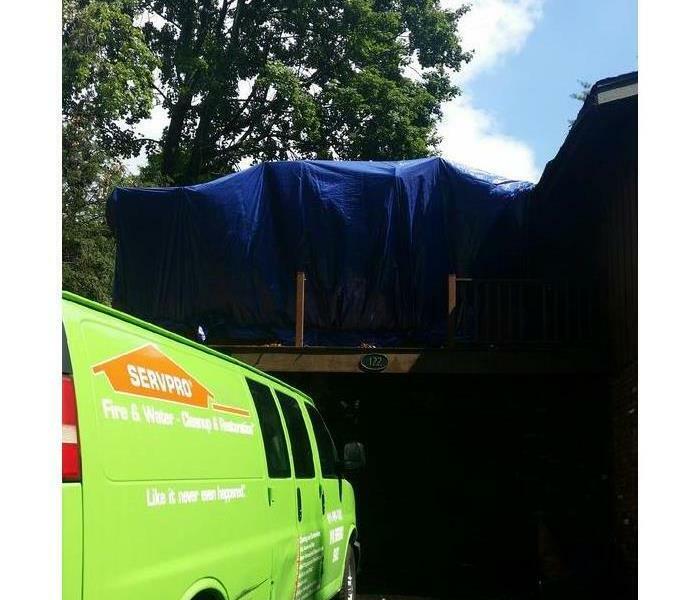 SERVPRO of Scarsdale / Mount Vernon responded to this home with severe mold damage. They have the training to stop the source of the mold then ensure the mold is clean and your home is safe. The technicians are trained for all types of mold remediation. Our Disaster Response Team arriving on site. 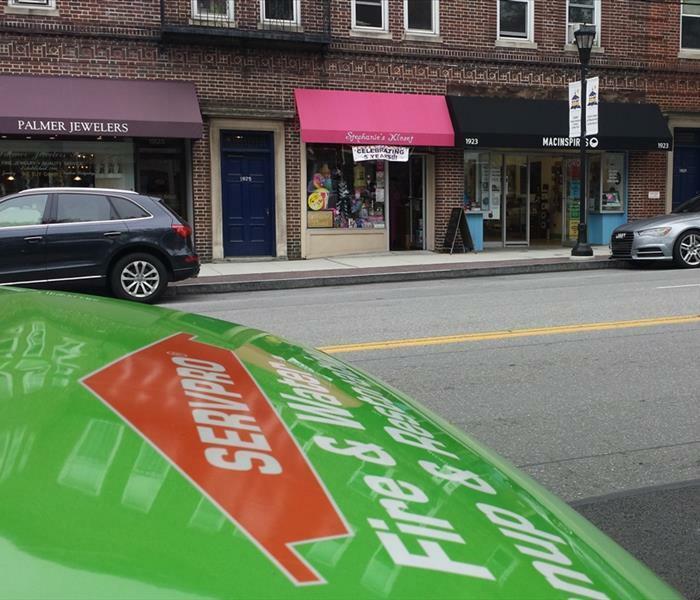 SERVPRO of Scarsdale/ Mount Vernon is Faster to Any Size Disaster! We are ready to respond 24 hours a day, 7 days a week, 365 days a year. 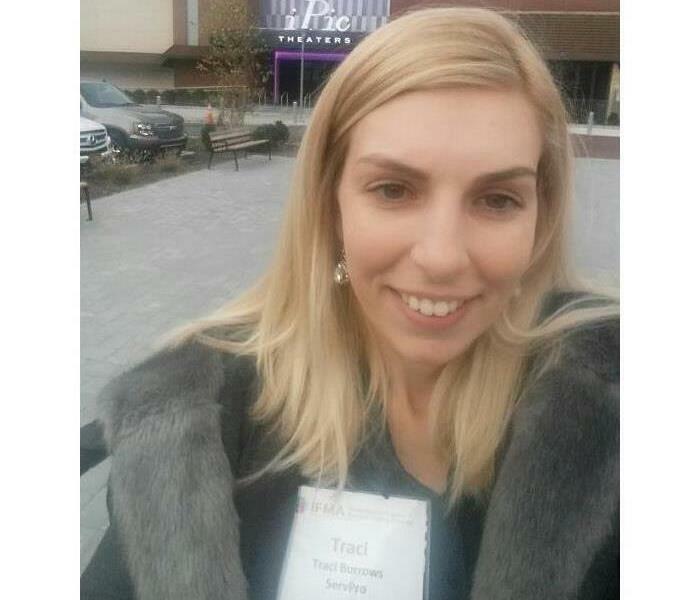 Traci at a recent IFMA meeting. Our team is proud to support IFMA. We love being involved and meeting the great businesses that attend. If you have any questions about getting involved with IFMA, let us know at anytime. 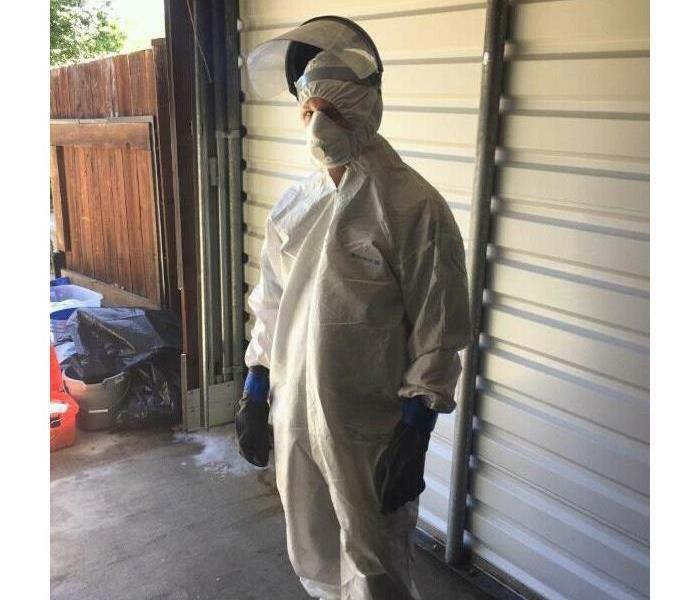 Our team is trained and qualified to remove asbestos from your property. If you have any questions, do not hesitate to reach out to us at anytime to ask. We have teams around the clock standing by. We like to give back to our community and one of the ways we do that is through events like this one. 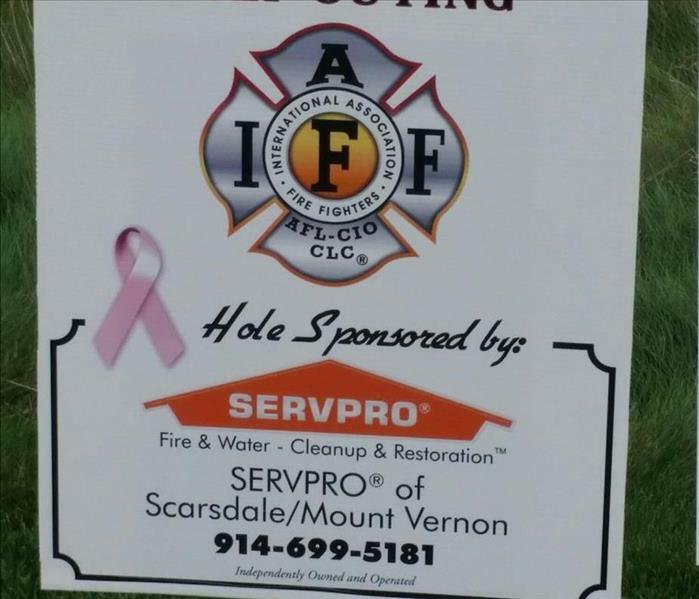 This event is one that is held every year by the Scarsdale Fire Department. 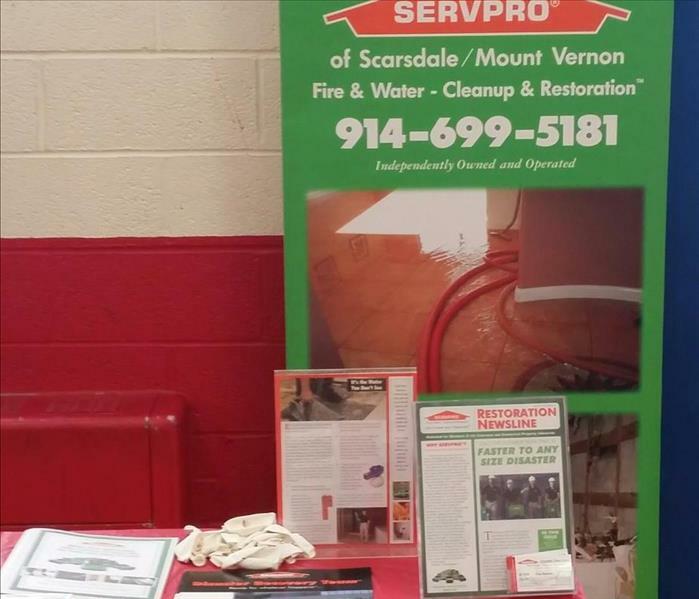 This photo is from a local event that is hosted by the Scarsdale Fire Department and sponsored by SERVPRO of Scarsdale/Mount Vernon. 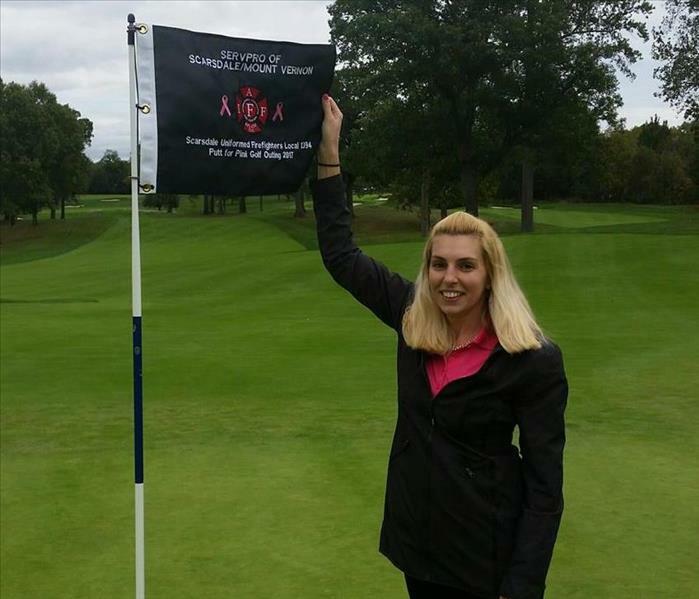 It is an annual golf outing that is held as a cancer benefit. 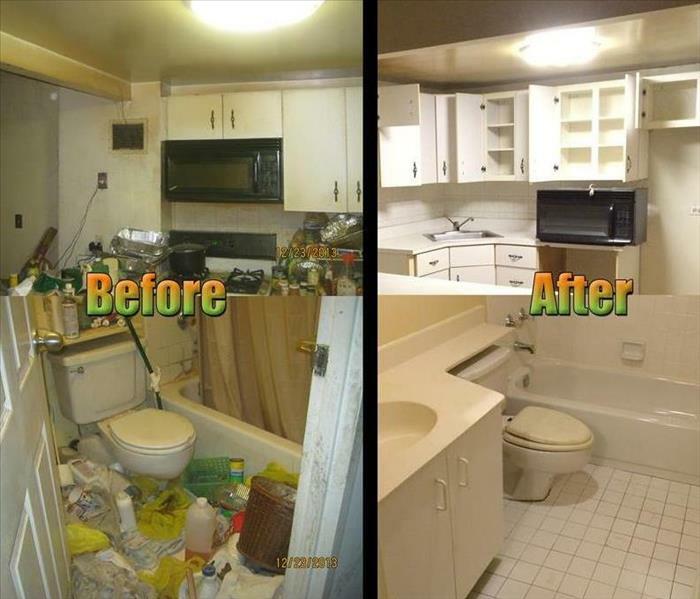 Our team specializes in cleaning houses that have dealt with hoarding. We come in and remove wasteful materials and begin the cleaning process. We make sure to take photos, before, during and after for your records. Our team is quick to respond to this Commercial Water Loss. We showed up and began the mitigation process. It is critical to work fast to make sure that secondary damages do not occur. If you any questions, do not hesitate to reach out. 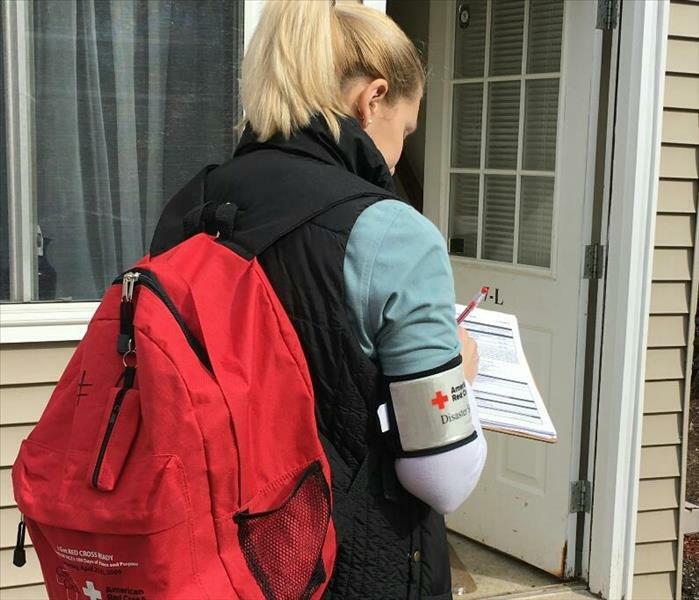 Our team is quick to respond to this flooded home. 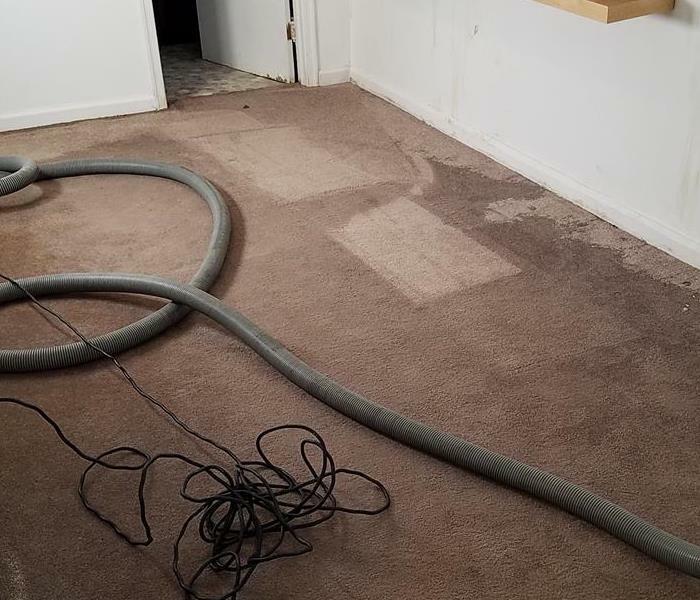 After a pipe malfunction, our team showed up with extractors and began to mitigate the damages. One the water was removed we began the drying process. As Bronxville Chamber of Commerce members, we are invited to exhibit, offer giveaways and safety tips or home restoration information to our community. Forrest and Hillary live in the neighboring town of Fleetwood, so these weekend events and tent exhibits are fun for us and we offer tasteful candy and free water to the children and parents. We sponsor the pony ride each year, too, as horse owners -- yes, we have a SERVPRO of Scarsdale horsie girl, too -- it's a menagerie! We responded to a local synogogue after an amazingly cold week with bitter temperatures, then a sudden warmup. For the past two Januaries, into February, these broadly ranging temps are breaking older NY state pipes in higher end commercial and residential buildings. 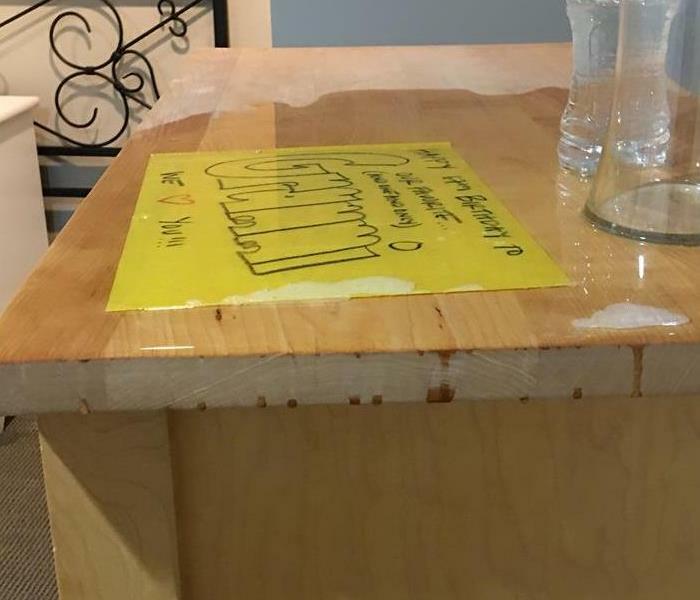 Either way, our SERVPRO of Scarsdale / Mount Vernon was on the case and on call, working 12 to 16 hour days and weekends for nearly three weeks, on water losses like this one. It's a living and they love us! This was a difficult fire because one of the family pets did not make it out and to safety. All of the humans were fine, but these soot and fire damages, with a water chaser and mold growth can be tough. It's not just about the cleaning, or boarding up such burned homes, but our crews have seen and felt how heartbreaking the losses of sentimental belongings can be for the families and tenants or homeowners. We try to make it "Like it never even happened," and often we're told that the home is cleaner than before, after we repaint and refinish, of course! 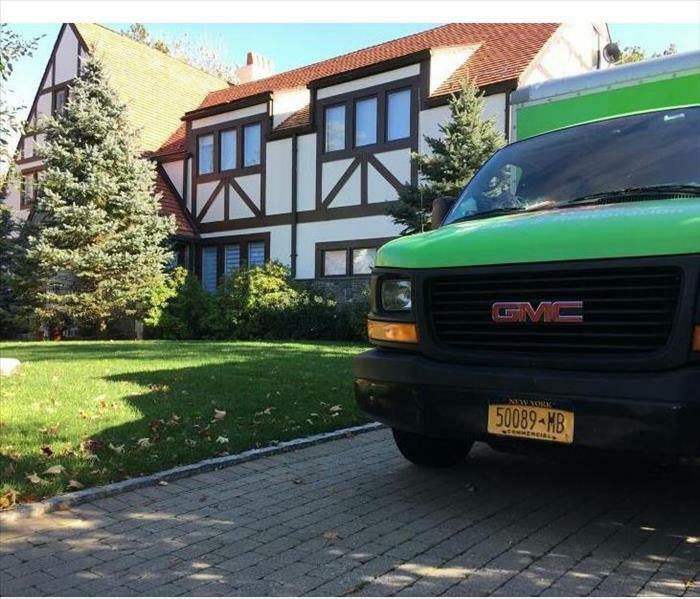 SERVPROS like ours in Scarsdale / Mount Vernon NY clean more than extreme disaster damaged homes and businesses. We also clean upholstery, curtains, carpets and area rugs (pre-testing for dyes and stains) as well as interior windows. Maid services are not even cleaning windows in NY state anymore because of liabilty concerns. But, our guys and gals are on ladders all of the time. We also help clean out and pack up homes in Hoarding, collecting and estate situations. 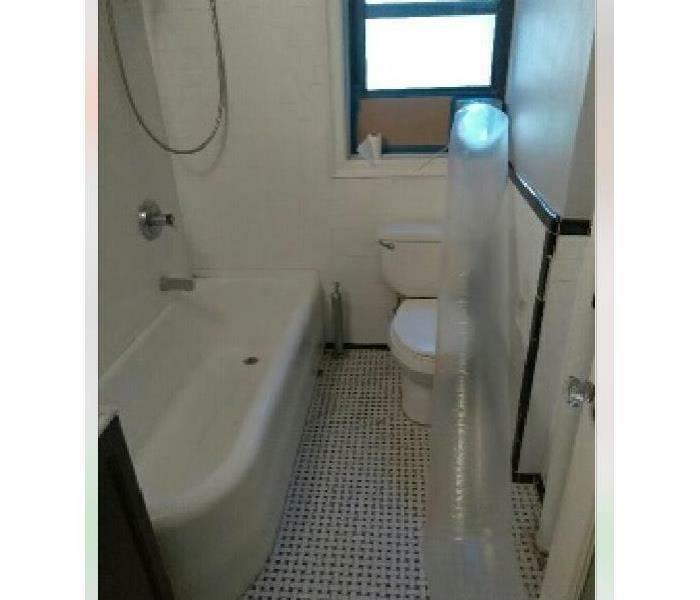 So, no cleaning or deodorizing job is too large or too small for us! 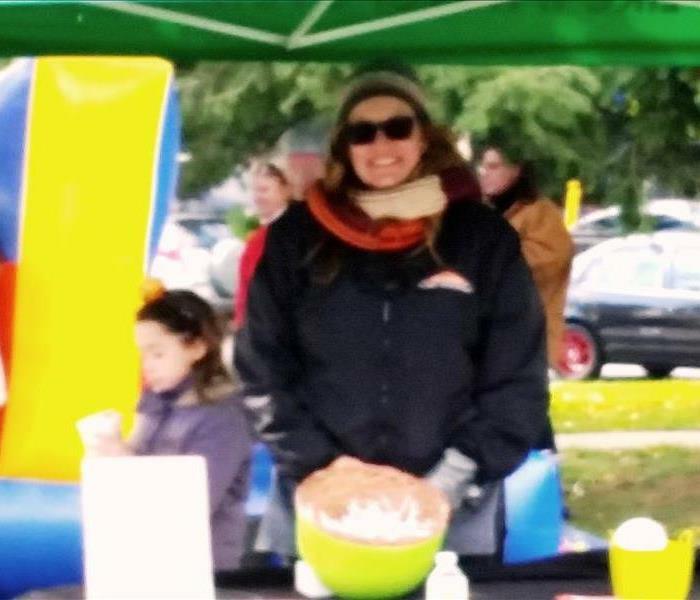 It's Spring and almost time to fundraise for American Cancer Society at Relay for Life - Eastchester, NY 10709 As usual, Hillary will be there as your Coffee & Tea lady, with a hot cocoa, herbal beverage chaser for the kids...or anyone who actually sleeps. Cancer does not sleep & neither do we, at least for this one night per year! Crush Cancer! A Row of Stores was flooded in our area & we were on the scene FAST! This is our truck in a busy shopping area near Larchmont, NY. The building owner has called us for his Bronxville and Scarsdale properties in the past. We did water damage cleanup for all four stores with awnings in this photo.